Railpictures.ca - Dave Burroughs Photo: All passenger lineup TH&B 401 and 403 with NYC 4061 rest at the TH&B’s Chatham St. roundhouse. The 401 and 403 represent 2/3 of the TH&B GP9′s equipped for passenger service. | Railpictures.ca – Canadian Railway Photography – photographie ferroviaire Canadienne. 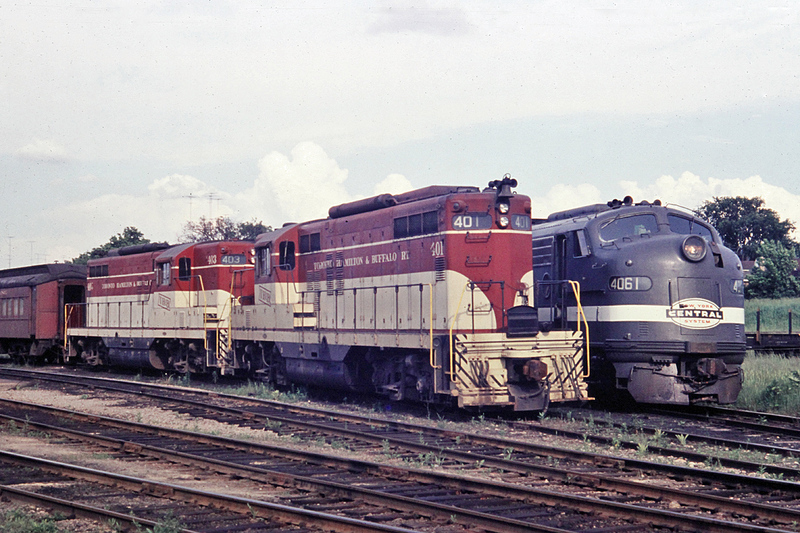 Caption: All passenger lineup TH&B 401 and 403 with NYC 4061 rest at the TH&B's Chatham St. roundhouse. The 401 and 403 represent 2/3 of the TH&B GP9's equipped for passenger service. From what I remember, they used to change the power on one of the passenger trains at Hamilton. The NYC power was put on for the trip to Buffalo. Conversely, the NYC power came off at Hamilton and TH&B power went on for the trip from Hamilton to Toronto. It was fairly common to see a single NYC E-unit at Chatham St. So Dave, aside from the fact that car must be broken down for you to post all these wonderful pics, I was never aware NYC E units ran into Hamilton ? Was it an odd ball one here?